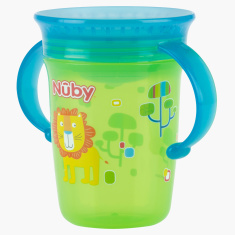 Nuby Sip Cup with Handle - 240 ml | Green | Non-Spill. Carry your child's food in this cup while on the go. It has an attractive print that will be loved by your child along with soft rim that is gentle on the child's lip while drinking.